The DPWH-SFDEO Inspectorate Team conducts a final inspection of the flood control structures along Binaliw River, Brgy. Binaliw, Calbayog City. 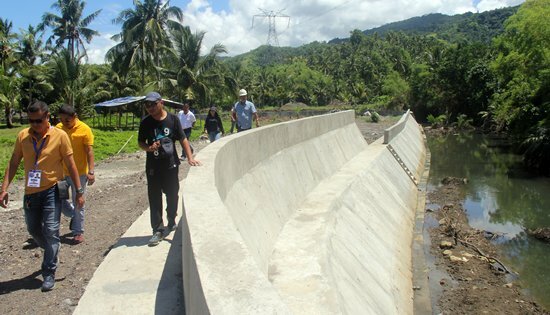 CALBAYOG CITY – The Department of Public Works and Highways (DPWH) -Samar First District Engineering Office (SFDEO) completes two flood control projects in Brgy. Binaliw, Calbayog City and Brgy. Cautod, Sta. Margarita. The Binaliw flood control project covers the construction of 96 meters of reinforced concrete river protection works on steel sheet piles foundation while the project in Brgy. Cautod covers the construction of 294 meter of flood mitigating structures. Each have an appropriation of P10 million sourced out from the 2018 General Appropriations Act (GAA) Fund. “I’d like to extend my warmest thanks to DPWH Calbayog for completing this flood control project. With the rainy season coming up, we no longer have to worry about the river overflowing. I am sure that my property and livestock will be safe during the typhoon season,” said Mr. Ricky Calendatas, a chicken farmer living along Binaliw River.